Waterproofing your basement in Indiana can be tricky at times, but there are also many great benefits to having a dry, waterproofed basement. If you have a basement and live in Indiana than you more than likely already know the kind water problems that a basement in Indiana can have. This is even more true in the spring and summer months when Indiana tends to get more rain that at other times. Because of this, many basement homeowners end up with an unusable basement due to the fact that every time it rains, the basement gets water. And worse than that is a finished basement that starts to get water. Water in a finished basement tends to ruin just about everything, from mold issues in the dry-wall to wet carpet in the living area. There are numerous reasons for why a basement gets water. Ranging from older drainage systems that no longer work, to water seepage through the foundation wall. That being said, Indiana basement homeowners should understand that it is possible to get and keep your basement dry permanently. This can be done by various basement waterproofing methods. To get a better idea on which methods would work best for your basement water problems, a basement waterproofing inspection is needed. At SwainCo. Crawl Space and Basement Repair, we provide free basement waterproofing inspections for Indiana homeowners. This allows us to inspect and evaluate your situation and provide you with the best possible solutions to keeping your basement dry forever. If your basement gets water than now is the time to schedule a free basement waterproofing inspection by clicking here. We can help you transform your wet basement into a dry, usable basement. 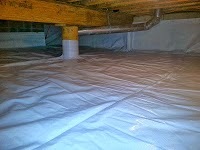 To find out more visit www.swaincollc.com or call 317-407-1868 to schedule a free basement waterproofing inspection.